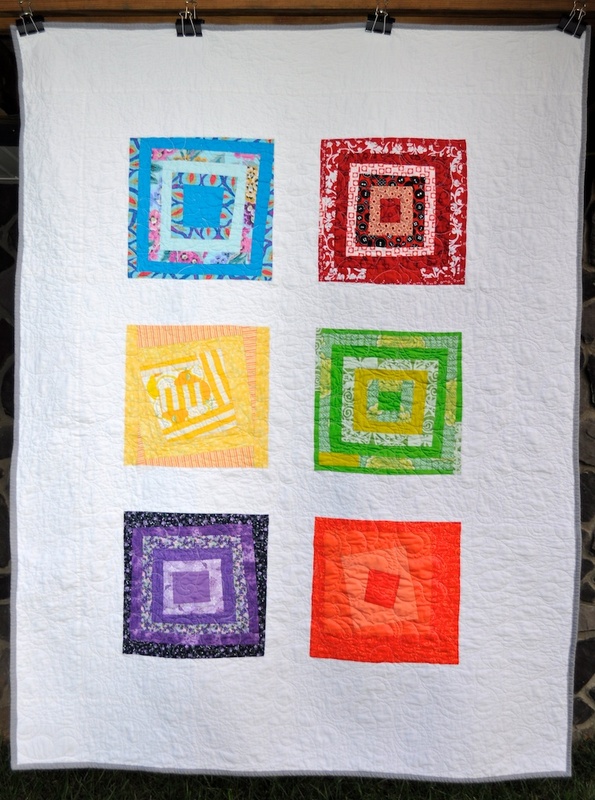 One of our SWV Modern Quilt Guild friends recently lost someone very close to her. I never know what to do in those situations (usually because there is sadly little you can do, other than be there if they need you), so I tend to sew or knit. For some reason it seems to be my immediate response when something bad happens. I wonder why that is….. Anyhow, I sent out a message to some of our members to see if they wanted to help me get together a comfort quilt. I thought something bright and cheerful would be appropriate, but also in keeping with the kind of colours the recipient likes (at least I hope). 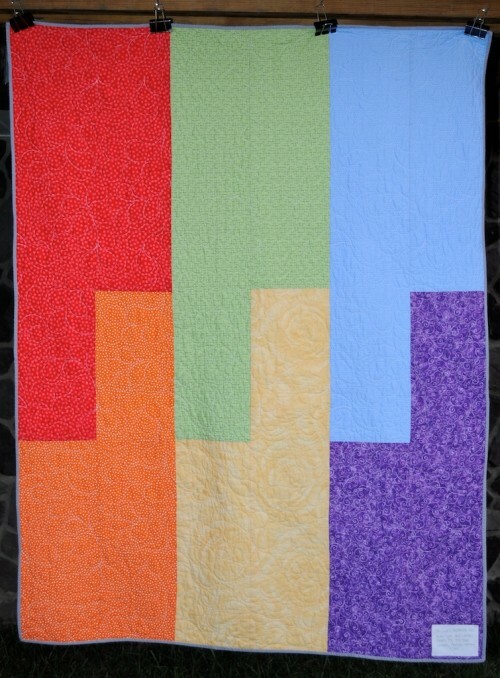 And since we are a modern quilt guild, I thought wonky log cabin blocks would be fun. Four different people worked on this quilt, and I love that it came together so well, even though we didn’t get to see anyone’s blocks before we made our own. I think the blocks represent their makers very well. It (obviously) incorporates the 6 colours used for the blocks on the front. 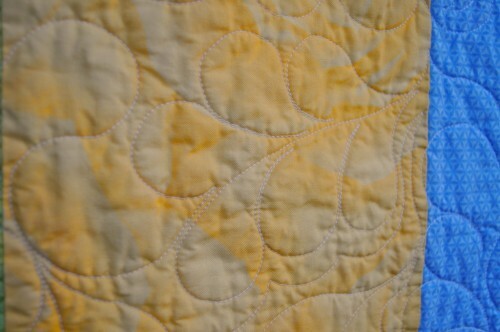 The quilting is a pretty feathery pattern, which I had not used before. I will definitely use it again though, because I think it is both feminine and modern. I can see it will be one of my favourites. The binding was Kona (Medium Grey I think) to frame everything together without being too distracting. Thank you so much to Lindsay, Melinda and Whitney for helping me with this. And also to Laura for the ever present use of your machine! We hope this quilt offers our dear friend lots of hours of comfort. We are here for you girlie. Beautiful! I’m sure it will be very comforting. Wow just discovered your blog and have been reading other pages. Love your quilts. 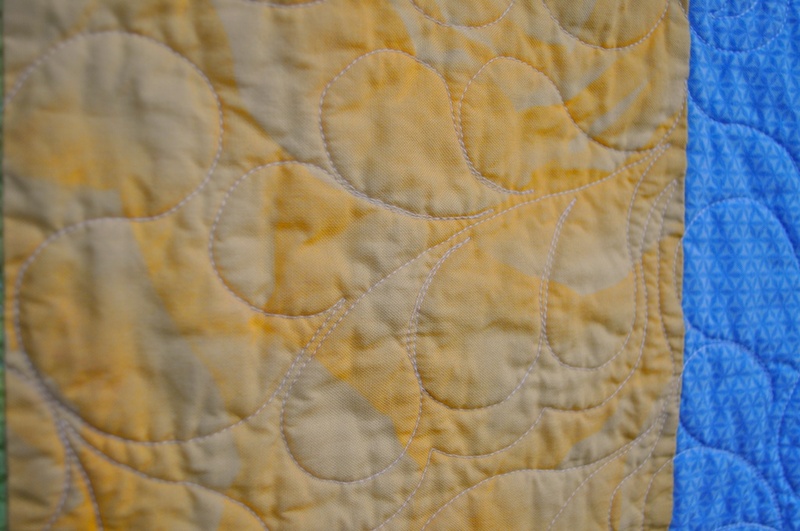 Just wondering if you could tell me how much fabbie you used for the Joel Dewberry Sparrow (yellow) gift quilt you made as I would love to make something similar but with browns n greens and a few more strips. Any help would be great.